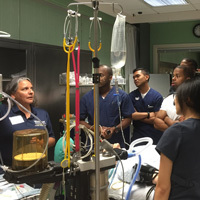 Steed leads a demo in a nurse anesthesia simulation lab. Increasing diversity in nurse anesthesia is an on-going goal of the field, and Webster University faculty members are part of the effort. Martina Steed, associate professor in the College of Arts & Sciences, was recently a faculty panelist for the two-day Diversity in Nurse Anesthesia Mentorship event in Pittsburgh. It was her second time participating as a speaker at the event, where she also met with prospective students who are interested in Webster’s MS in Nurse Anesthesia program. Nationally, nurse anesthetists perform about 80 percent of anesthesia for patients, yet only about five percent of the field is made up of minorities. With the profession’s emphasis on patient advocacy and safety – and the need to communicate that to patients – increasing diversity is essential. 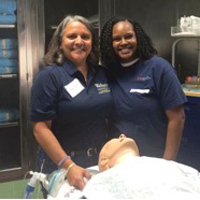 Diversity in Nurse Anesthesia Mentorship was founded 10 years ago by Wallena Gould (EdD, CRNA, FAAN), a CRNA who is dedicated to increasing diversity in nurse anesthesia. The group aims to achieve this not only mentoring interested registered nurses through the graduate nurse anesthesia application process, but also by actively mentoring them while they are in their nurse anesthesia programs to help ensure success. Steed’s presence on the panel supported that effort, as well as socializing prospects into what the profession entails. Also during the two-day event, she led attendees through a lab simulator demonstration.